I walked into this place and Christine took me right away. I told her what I wanted and she did it. She was so sweet and kind while working and made my hair look great! I have been coming to Plaza Hair Salon for two years now and every single time I leave I walk out loving my new hairstyle done by two amazing hairstylists named Mai and Loann! I come to Plaza Hair Salon whenever I need hairstyle refreshment. The salon feels cozy and the stylists are always smiling, happy to answer all my questions about my difficult hair. Mai was amazing! This was my second time getting my hair done here and I can't wait to go back! Everyone is very professional and sweet. Mai did a great job of lightening my hair, and telling me how to care for it once I left the salon. Had our appointment with Kim for me and son. Very friendly staff and very courteous. Make sure you check for the coupons from their website. 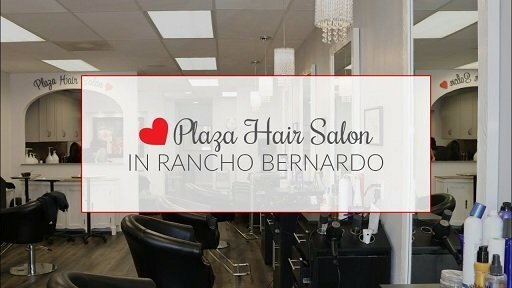 Plaza Hair Salon has a modern and exclusive décor with a great location in the growing area of Rancho Bernardo, CA. At the salon we are dedicated to make everyone looking their best and we focus on providing the highest quality hair treatments keeping the integrity of your hair. All of our hairstylists are experienced and are always screened and selected so they can offer our clients the same treatment and care as we do. At Plaza Hair Salon we specialize in the latest hairstyle trends, newest haircuts and hair coloring techniques, we regularly have color classes at the salon and attend hair shows.